Like so many before me, I’m afraid to say, I have some unflattering qualities. I’m prone to interrupting and am wildly competitive. My hair makes me look like a Fraggle when I wake up and I have been told on more than one occasion that I am nearly unbearably cheerful in the morning. I think To-Do lists are fun, and find a timer a helpful addition to more situations than is healthy. And I am a hideous control freak. It’s bad. I’m working on it. Well, sort of…part of me has just given in to this reality that I have a strong, undulating need to control most situations. Like I said…it’s bad. 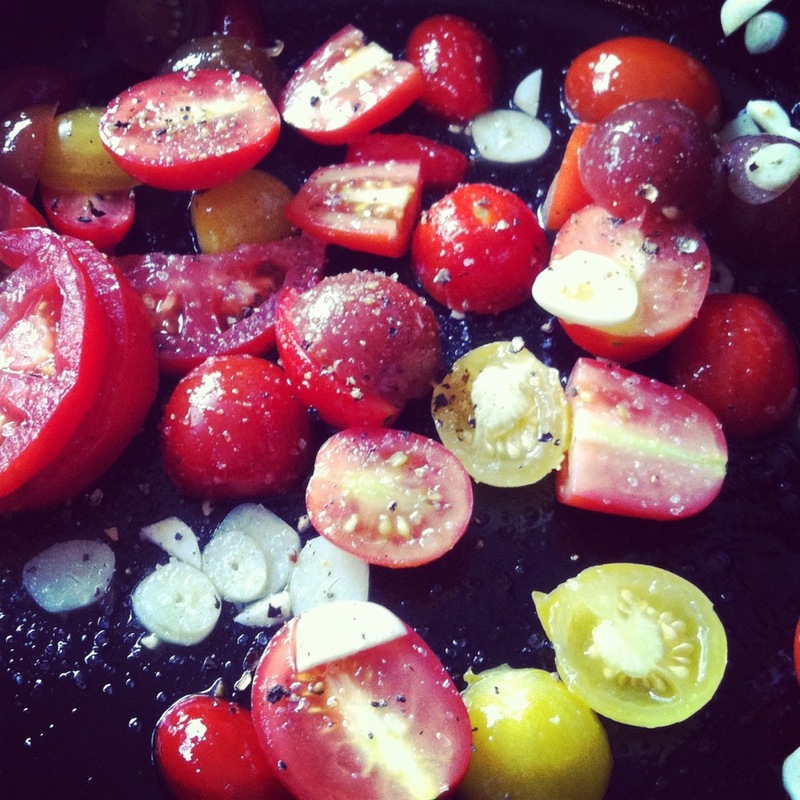 Such little jewels…cherry tomatoes waiting to be roasted. As proof of this dreadful quality I input all my receipts into a monthly Excel spreadsheet. Are you shuddering yet? You should be. And yes I know about Mint but am too much of a control freak to trust it. This past weekend as I was closing out August I gasped in horror at my Groceries line item. As you would probably expect I tend to spend more on food than some people do, but August was out of control. Let’s just say if you can feed a starving child in Africa for $1 a day I could have fed a few children for a few years. And this doesn’t even address my “Eating Out” or “Fun” line items. It was time for drastic measures. And so, with the determined resolution you could only expect from someone like myself, I put a moratorium on all food purchases. Admittedly, I have a very stocked kitchen to begin with (add “obsessive and irrational fear of second potato famine” to the list of faults), but I’m actually now having fun seeing how many gourmet meals I can create with just what’s in my kitchen at the moment. This quiche was one of my first attempts to take a classic and fake it a bit with ingredient swaps. Craving a rich quiche, but not having any milk or cream I decided to use some yogurt, of which I have loads. The result was nearly as good as if I’d made it with the traditional heavy cream or half and half, and as an added bonus was healthier to boot. What are your favorite “Use Up Everything In the Refrigerator” recipes? Toss the tomatoes, garlic, drizzle of olive oil, and grind of salt and pepper in a cast iron pan, and roast until liquid is melted and flavor is concentrated. About 30 minutes. Set aside. Meanwhile, saute the leek in remaining 1 TB olive oil, until softened, about 6 minutes. Set aside. On a lightly floured surface, roll out the pate brisee until a slightly larger circle than the pie plate. Fold in half for easy transfer, and move over to the pie plate. Unfold, trim the edges so even, fold crust under itself, and flute the edges. Add the leeks, cheese, and tomatoes to the pate brisee. Cover with the egg/yogurt mixture and bake 20 – 25 minutes on the middle rack, until golden brown, egg set, and cheese slightly bubbling. freaky. that first part sounded a bit like you were describing me. i hear you – our food bills are OUT of control. i am constantly thinking of ways to cut back but my husband eats enough for 4 football players so that is a bit of a challenge. my favorite clean out the fridge dishes are usually soups or stir fries! I knew there was a reason I liked you! Ah yes…the husbands…aka…the Human Hoovers…they eat EVERYTHING! Day 12 Emmy….no groceries…I’m actually having fun. And I did get my CSA box today…so I suppose that’s sort of cheating. Wow! I am seriously impressed. How long do you think you can go? What do you miss? Your public needs a post about this, I think, it sounds like big news to me! I don’t know!! I’m getting oddly into it…the other night we did pizzas with assorted toppings…b/c who doesn’t have flour, yeast, and random stuff to throw on top…they were delicious…and tonight I did yummy tomatoes stuffed with curried quinoa. Recipe and pix forthcoming, since I just got a new camera, and am obnoxiously excited about it. Awesome. 🙂 It sounds like you’re eating better than I am and I’ve shopped twice this week! Yep. Sounds like me…spend way too much grocery shopping and I’m a control freak, bad lol! Those tomatoes look delish! Too much money on food, and an overbearing need to control appears to be a theme of us foodies! Why is that?! As for money, yeah. I break out in a cold sweat of indecision over buying a single item of clothing for myself, but will spend $200 every few days at the PCC without any remorse whatsoever. The family eats well. I couldn’t agree more Susan. Designer jeans? Who needs ’em. New glasses? Nah…squinting is in. Would love to non-competitively Iron Chef with you sometime in the ‘hood. Let’s make it happen! Oh how I love to read your posts Erina! Not only are you enthusiastic and organized but highly entertaining. :). And love, love this quiche! You are so sweet…thank you! I’m still craving those fish tacos you posted on your blog the other day. I was actually thinking of you this night and how lovely it is that you often provide whole meals on your blog…love that. Such a nice touch versus simply one component. Note to self. Hahaha! Probably comes from working with clients and creating nutritionally sound whole meals for them daily. I come home and end up doing the same for my family. Not always, but most the time. And we never get enough veggies so I’m always thinking of ways to encorporate them into dinner. Honestly though, somedays I just want a bag of popcorn and a glass of wine. LOL! Ahh the monthly budget reality check. I go through this at least every few months when I freak out and swear to only cook with what I have on hand (fortunately, like you, I have a compulsively stocked pantry). Anyway, this sounds amazing and I love subbing yogurt for, well, everything. What are your other favorite sub-yogurt strategies? I have loads I need to use up! Lol……my mom and I would do this all the time. We would scour through the fridge, the freezer and the pantry and come up with the most awesome dishes. Whatever we came up with would be a surprise to the other. We called it “iron cheffing”….it was always a blast! Keisha…you’re making it sound positively glamorous! I like your style. Iron Cheffing…that’s what I’m going to call it from now on. I recently created a grain salad trying to clean out the fridge and pantry — bulgur wheat, sambal oelek, lemon juice, olive oil + the wilting veggies in the crisper. Turns out sambal oelek really does make everything salty and delicious. 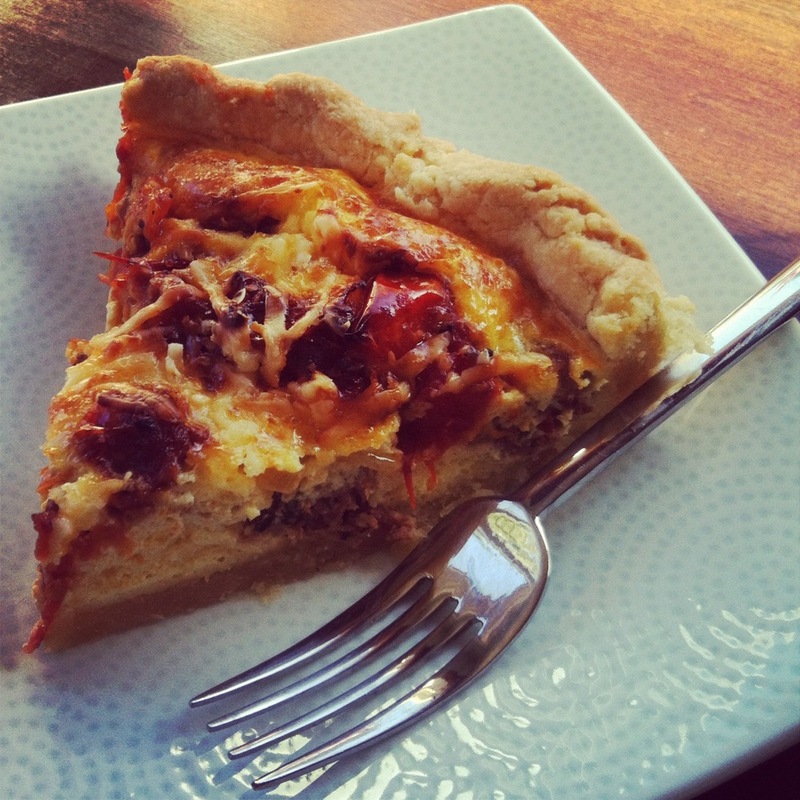 Yogurt in a quiche is a perfect idea! I love it. Usually when we have a fridge full of rapidly expiring ingredients I make some sort of stir-fry, or throw all the vegetables that go remotely together into a pasta sauce. Then I end up with things like chicken sausage-leek-beet green-bell pepper melange for lunch. It works out pretty well! I’m glad to know the yogurt in quiche situation is moderately acceptable. I don’t know why I never do stir-frys…but I don’t. However, I certainly see the merit in them, particuarly for the Use Up the Kitchen Sink strategies, so perhaps it’s time to consider them again. Yum, I just made a tomato tart with goat cheese, but this looks even better– guess I should have used gruyere instead and added eggs too! Anyway I am with you on feeling guilty about ludicrously massive grocery bills (and I’ve never had any other type…) for both rational and irrational reasons. I’ve definitely had financial freak-outs where I decide I need to cut back on spending and live off only the stuff in my fridge/freezer/cabinets– and they are well-stocked, too, since I have an OCD need to never run out of any of the ingredients that I deem essential (and that is an ever-growing list). But it’s a trade-off because I know that *in general* I will eat healthier if I’m continually buying fresh produce, so then I go to the store and attempt to ONLY buy produce there and cross my fingers that I’ll have the willpower not to buy too much of that, or too many other things. I really just need to plan my menus in advance as meticulously as I keep track of my finances after the fact (like you! ), but a lot of what I love about cooking at home is all the spontaneity it allows– to be able to go with what you’re craving– so I doubt I’d be able to stick to a menu plan either. Never apologize for rambling…hearing that there are other…shall we say quirky…people like me out there is part of what I love about this food blog thang we do. I like your rationalization about the groceries…that’s how I defend buying a lot of wine. Ergo…if I buy really nice wine, then I’ll be more inclined to cook dinner in and drink said wine, thereby saving money! Love this post, Erina! You are not alone in freaking out over the grocery budget…you are inspiring me to dig through my pantry and use what we have. Not visiting the grocery store as often saves time, too. Your quiche looks fabulous! Glad to know I’m in good company, Hannah! You are so right about the no grocery trips also saving time…I’m actually enjoying it for the most part…and it’s going to make grocery shopping come October seem like a luxury rather than a chore!